There have been no important economic reports in Japan or the US therefore USDJPY is under the influence of Yellen’s speech. 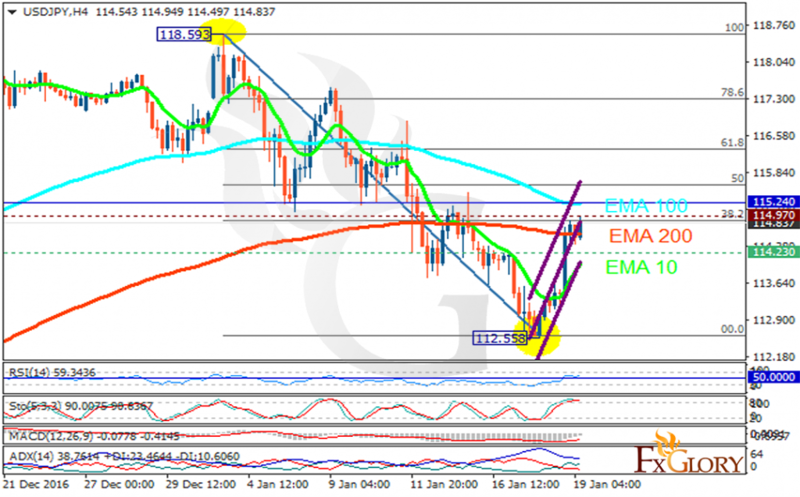 The support rests at 114.230 with resistance at 114.970 which both lines are below the weekly pivot point at 115.240. The EMA of 10 is moving with bullish bias along the ascendant channel but it is below the EMA of 200 and the EMA of 100. The RSI is rising towards the overbought area, the Stochastic is moving in high ranges and the MACD indicator is in negative territory. The ADX is showing a buy signal. The chart seems to be bullish to cover the previous decline. The bullish trend will continue until it reaches the 61.8 level of Fibonacci retracement.